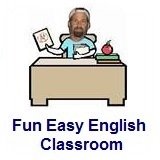 ﻿ Fun Easy English - new classroom free online classes english language lessons speaking listening writing reading december 4. Today in the classroom you are going to learn some slang beginning with the letter Y. Today learn slang beginning with the letter Y.
yakety-yak talk about unimportant things My friends yakety-yak whenever they get together. yank bother You need to quit trying to yank me. Yank an American Maybe you should not act like a Yank when you go to Japan. yes-man person who does anything to gain approval Everyone in the office know he is a yes-man. yukky bad This food tastes yukky. Yakety-yak basically means talking about useless or unimportant things. 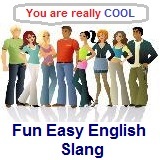 The following video is a pretty old song featuring this slang term. Enjoy. The Coasters are an American rhythm and blues/rock and roll vocal group that had a string of hits in the late 1950s. This is their song "Yakety-yak" with lyrics written in English.